By John W Borsa Jr.
Ill. Dale I. Goehrig 33° Sovereign Grand Inspector General in the Orient of Florida will retire his post as of December 31, 2017.The popular Scottish Rite Official and Past Grand Master will term out after serving as the head of Scottish Rite in Florida since 2010. The announcement was made at the Biennial Session of the Supreme Council this past August in Washington D.C. He succeeded the late Ill. Brother Robert L. Goldsmith, 33° and governed over one o the largest Scottish Rite Orients in the United States. Ill. Goehrig plans to remain active in the fraternity. 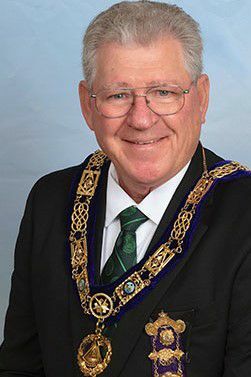 Ill. Rick Hoover, 33°, Grand Master of Masons in Florida has been named by the Sovereign Grand Commander to fill Ill. Goehrig’s position as Deputy of the Orient of Florida. Welcome aboard Ill. Hoover!! Below are several pictures of Jacksonville Valley Scottish Rite Brothers in costume at the Reunion. The following degrees were conferred:4o, 5o, 14o, 18o, 21o, 29o, 30o, 31o, and 32o . Brother Fred Wright, 32° and other brethren from the Valley of Fort Myers visited Englewood, FL Lodge 360 on February 16, 2016 as representatives of the Supreme Council to recognize Br. Paul Katrenak, 32°, for his completion of the Master Craftsman Program. The Scottish Rite Master Craftsman Program is a course of study offered to 32nd Degree Master Masons under the guidance and leadership of the Supreme Council, 33rd degree, of the Ancient & Accepted Scottish Rite, Southern Jurisdiction, in Washington DC. The Program is designed as an advanced education in the Symbolism, Ritual, History, and Philosophy of Freemasonry and the Scottish Rite. In the photo below, Br. Fred Wright (left Center) presents Paul Katrenak (right center) the Scottish Rite certificate for successful completion of the Master Craftsman Program. Far left is Worshipful Stoney Stonecipher Master of Englewood Lodge and far right is Illustrious Harry Schafer, 33°, President of the Englewood Scottish Rite Club. Submitted by Brother Fred Wright. Team 24 from Saskatoon, Saskatchewan, Canada visits the Panama City Valley. It all started when our Brothers Ill. Dean Resch and Mark Krautheim met a couple of Canadian Brothers on a cruise they were on together. It culminated when “Team 24” from Saskatoon, Saskatchewan, Canada demonstrated their 24th Degree during our 138th Reunion on March 11th and 12th. Things finally came together and with permission of our Sovereign Grand Inspector General the plan was set. Eleven of our Canadian Brothers made the trip south to Panama City and attended both days of our Spring Reunion. On Saturday during lunch “Team 24” called up Ill. Resch, our Personal Representative, General Secretary, Master of Kadosh and eight members of our Knights of Saint Andrew and made them honorary members of “Team 24” and presented them with lapel pins and baseball caps. In a special presentation our Valley was also given a Canadian flag. In return the Valley of Panama City presented “Team 24” a 33rd Degree cap to be displayed in the Valley of Saskatoon, Saskatchewan. After lunch and our portrayal of the 21st Degree the lodge room was set up and the 24th Degree was demonstrated beautifully and with great drama. Portraying King Solomon was none other than the Deputy of the Supreme Council for Saskatchewan, Ill. William C. Fitzsimmons. The team was assisted by eight members or our Knights of Saint Andrew who filled in non-speaking parts. It was a wonderful Reunion with our Canadian visitors and a large turnout of our own members totaling approximately 95 in attendance. We were also thrilled to have some members back in the Valley who had been unable to attend in some time due to illnesses which made it really like a Reunion. On March 14, 2016 The Valley of Tampa held an impressive ceremony of Remembrance and Renewal honoring those members who have made the transition from this transitory existence to one of endless duration. The ceremony of The Mystic Banquet and The Extinguishing and Relighting of the Lights was conducted with precision and dignity. The words of this ceremony speak to the hearts and minds of all men. But words alone do not suffice. It is our actions which speak louder than our words. Intention without action is of little value. The Ceremony of Remembrance and Renewal, including the Mystic Banquet, is not a religious observance. It is neither the Feast of the Passover nor a Sacrament of Holy Communion. It is an observance, a sublime celebration of Rebirth, Freedom, and Fraternity. Speakers: Ill. John Drewett, 33°, Ill. Louis King, 33°, Ill. Rick Hoover, 33°, Ill. Louis Ortt, 33° and Ill. Patrick Palmer, 33°. Scottish Rite Guard: Henry Echezabal, 32°, Rodney Kohler, 32°, Ken Warner, 32° KCCH, Sam Pesola, 32°, Charles Walter, 32°, Leonard Smith, 32° KCCH and Ken Balsley, 33°. Knights of Saint Andrew: Chuck Osborne, 32°. William Sundquist, 32° and Robert Phillips, 32°. Bagpiper: Rob St. John, 32°. Soloist: Brian Campbell, 32° KCCH. Paraphernalia: Lynn Raposa, 32° KCCH. Even our SGIG, Ill. Dale I. Goehrig, 33° took part in the ceremony by presenting the widow with a rose to close the Memorial Service. Caused grieving hearts to heal and to mend.